HONOLULU (HawaiiNewsNow) - Lt. Gov. 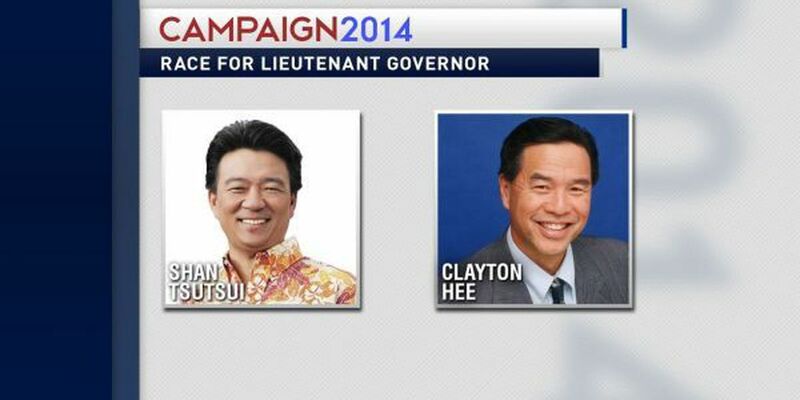 Shan Tsutsui, the incumbent, won against state Sen. Clayton Hee in the Democratic race for lieutenant governor, with 111,262 votes, or 51.1 percent of the votes counted in the fifth printout. As lieutenant governor, Maui-based Tsutsui is spearheading the state's efforts to bring President Barack Obama's presidential library to Hawaii and is in charge of attracting major sporting events here. He also created an after-school enrichment program for middle schoolers. As a former state Senate President, Tsutsui was appointed to the LG's post in 2012 after Gov. Neil Abercrombie named Brian Schatz to replace the late U.S. Sen. Daniel Inouye. In the Republican race for lieutenant governor, Elwin Ahu defeated his opponent Kimo Sutton with 24,422 votes, or 62.1 percent of the votes counted in the fifth printout. Prior to becoming the pastor of New Hope Christian Fellowship in 2000, Ahu, a Republican, served as a lawyer in Hawaii for about 15 years and a judge for 5 years. He said his experience would help propel him in the lieutenant governor's office.